Heartbroken or in a panic over the prospect of the Trump presidency? 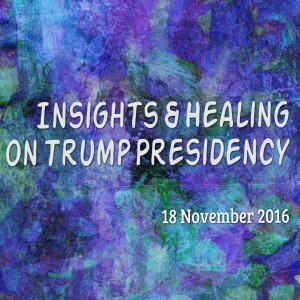 I did a healing release and live Oracle transmission call on 18 November to help those (including myself) who continue to struggle with the ideas of what this president-elect might do to the United States and the world at large. As it turns out, it’s not as bad as we might expect, though it certainly wont be a cake-walk. If you’re in need of some Divine Perspective and healing around this topic, please accept this as an offering from my heart to yours. Simply provide your name and email below, and I’ll send you the link to this recording to use whenever you start to wobble or go into fear.